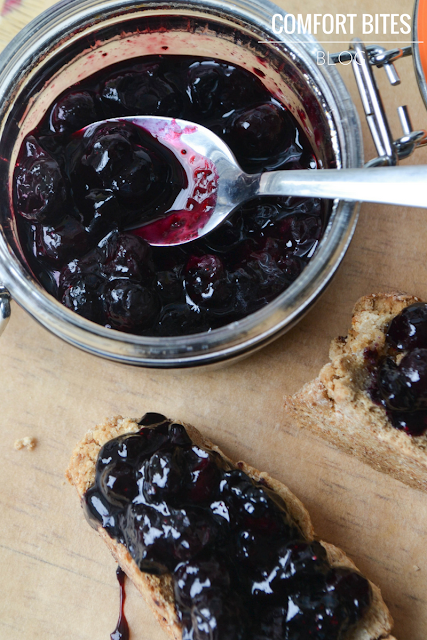 A refined sugar free blueberry jam that's sweet, tasty, and takes just 5 minutes to make. AIP compliant and vegan. This post contains some affiliate links. This means that if you decide to click on them and make a purchase, I might receive a small commission that goes back into helping me keep the blog going. Thanks for your support. Did you know that a single jar of jam can contain about 250g of sugar added to it? And that's not including the natural sugars from the fruit itself. That's just the white stuff that's added to it. When you make jam, you usually use a pretty much equal share of sugar to jam. I just searched for recipes to test this, and if there's 900g of berries used in a jam, it suggests 900g sugar. Another suggests 1.25kg of berries, and then 1.25kg of sugar. True, that will probably make you a few jars full, but even so, that's a LOT of sugar. I realised that it didn't make much sense to go to the trouble of baking a low sugar loaf or scone, only to smother it in piles of shop-bought jam that undoes all your hard work. And when I thought about making a refined sugar free jam, I realised I'd been making it for years, without knowing it. Do you remember my Blueberry Topped Baked Sweet Potato recipe, here on the blog? How about the blueberry sauce I made for the AIP Pancakes I made for Primal Eye Magazine? This is the same thing, but just cooled and set in a jar. Genius. Play around with the flavours. Add lemon zest towards the end. Maybe try mixing the berries up - like half raspberries and half blueberries or blackberries. Try it with strawberries. You might not get the wobbly set-ness you will with shop bought, but my goodness, this is so much better for you. And it's home made, so you can pat yourself on the back for having little jars dotted about in the fridge, knowing that you made it. Oh, and the best part? It takes 5 minutes to make. The bread that I've photographed the jam on is Sweet Treat's AIP Irish Soda Bread - I love it. It was easy to make and was good when I fancied something bread-like on AIP. Clatter the blueberries into a shallow frying pan or saucepan. Turn up the heat and watch, as the blueberries start to defrost, or if they're fresh - they'll start to release their dark purple juices. Straight away, pour in the maple syrup and the vanilla and stir. As the blueberries soften, crush a few of them under the weight of your spatula or wooden spoon. Just a few - you want to create a sticky sauce consistency, but you will want mostly blueberries intact. Give it a stir and increase the heat, watching the jam bubble away. At this point, you want to evaporate some of the juices, leaving you with a soft, jam-like texture. Don't let it burn, though. As soon as the jam reaches the texture you want - the whole thing should take under 5 minutes - tip it into a waiting jar and allow to cool. 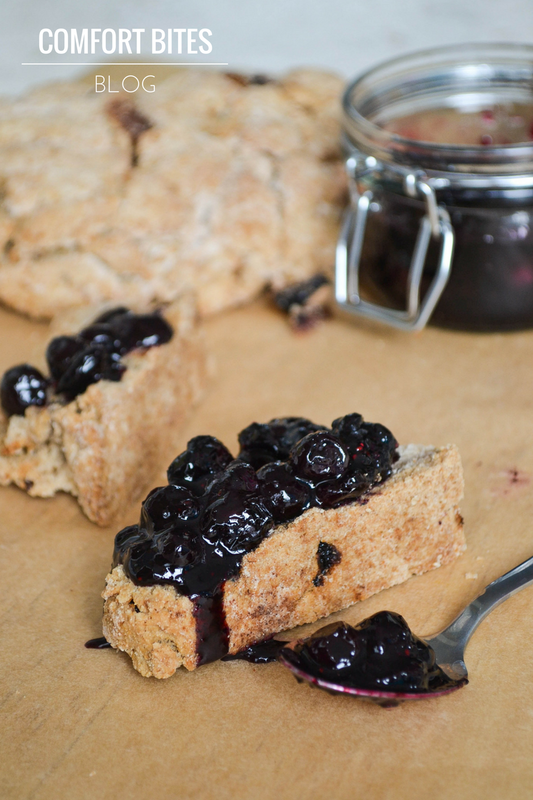 Once cooled, eat with scones, jam, pancakes or your favourite paleo bread. It will keep in a sealed jar, for about 3-5 days in the fridge, although ours never lasts that long! Come and visit my Pinterest board with lots of AIP and paleo breads to help inspire you.